The Department of Art Research, Archives and Information Systems organized a two-day open lecture in the seminar room of the Tokyo National Research Institute for Cultural Properties (TNRICP) on November 4th and 5th, 2016. This year’s seminar marked the 50th milestone. Every autumn, TNRICP invites people from the general public to attend presentations given by its researchers and invited outside lecturers on the results of research that they conduct on a daily basis. This program is not only held as part of the Lecture Series of the Ueno no Yama Cultural Zone Festival organized by Taito Ward but is also associated with Classics Day on November 1st,2016. 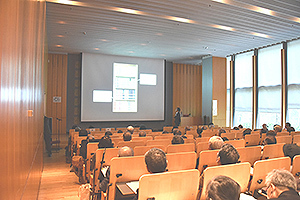 The following four lectures were given this year: “Documentation Activities and Archives – A group of materials on the Year Book of Japanese Art and its transmission (Hideki KIKKAWA, Researcher, Department of Art Research, Archives and Information Systems) and “Wolves Coming Back into Existence – Yamatsumi Shrine in Iitate Village – On the Restoration of the Ceiling Paintings) (Kyoko MASUBUCHI, Curator, Fukushima Prefectural Museum) on the 4th and “Techniques to Hand Down Forms – Welcome to the backstage of an exhibition) (Chie SANO, Director, Department of Art Research, Archives and Information Systems) and “Forms to Memorize and Those to Find – Meanings and Value of “Cultural Properties”) (Ken OKADA, Director, Center for Conservation Science) on the 5th. The event drew a total of 159 visitors from the general public over two days, and gained favorable reviews.